If you've dreamed of the Swiss Army Knife of baby carriers, I present to you the Boba 4G Carrier: the Original Soft-Structured Infant Carrier (in Tweet, because, well, I'm a social creature). With Asher, who is now 2.5 years old and who I stopped baby wearing at about a year because mama's back hurt, I started out with a sling and then moved on to a structured carrier that I tried desperately to love but simply couldn't fall head over heels for. Mr. T carried Asher in the beginning in a makeshift moby wrap, but that was never my jam. After taking a gander at what we had, I realized I needed something more. I needed something that both did more and was super comfortable, and this is where the Boba came in. I did a lot of searching on the web, and when I came across this carrier I was breathless. Although, yes, I received this carrier for free for review, it puts the other carriers I've reviewed and purchased to complete and utter shame -- in the best way possible. Why? The features make it the ultimate carrier from birth through the moment this little munchkin decides to run free. The most attractive features to me were the infant support, because Little T is pretty little still, pockets pockets and more pockets, and adjustable straps that won't make this curvy mama feel like a sausage while she carries (one of the reasons I hate most wraps and carriers). The best pocket is along the base strap, and it's perfectly sized for my iPhone, which means it's always there. The pocket where the sleeping hood lives is another gem, because the hood snaps out, so if you want to use the pocket for something else it's totally yours to play with. I'm also super jazzed about the foot straps because they keep your growing child from having their legs uncomfortable dangling at your side, and the purse strap holders because, come on, bags slipping down your shoulders isn't fun for anyone. It took a bit of tugging and adjusting the strap that runs along the upper back, but once I got it pulled just right it has made carrying Little T a dream. The other bonus? She falls asleep about two seconds after I put her into the carrier, and I can't seem to figure out what kind of magic this is, but I'm happy it exists because it lets me do something that every mother of two struggles with: give attention to my oldest, super adorable toddler while also holding and caring for my baby. Epic. Babywearing. Win! Honestly, this carrier lets me be a better mom, and that is absolutely priceless. Have you tried the Boba in any form? 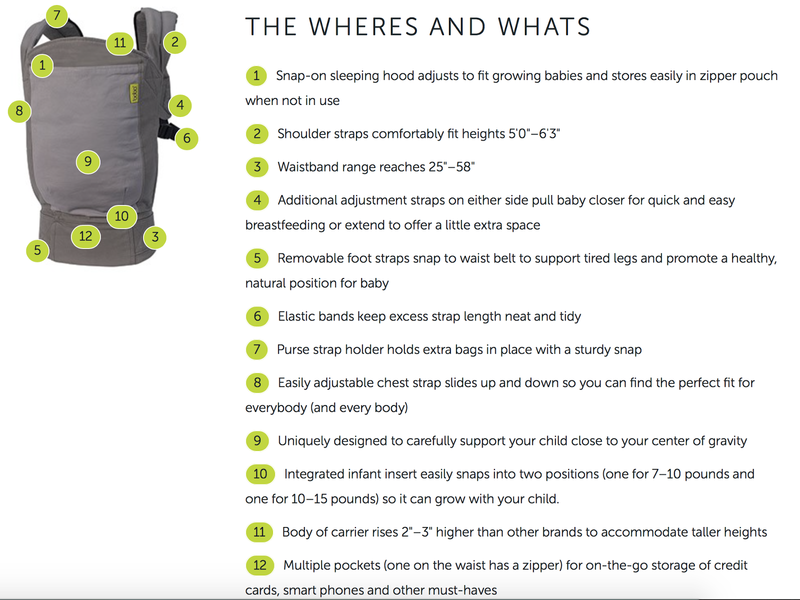 Do you have a favorite baby carrier, and, if so, which one and why?